This article is about the character from the live-action film. For the original video game character, see Mario. 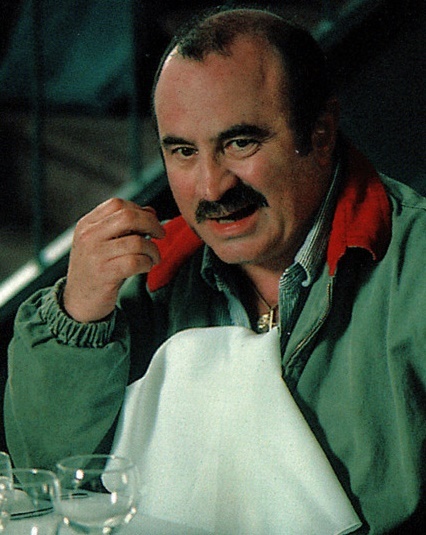 Mario Mario, played by Bob Hoskins, is the main character of the 1993 film Super Mario Bros. He is portrayed as a Brooklyn-born plumber and co-owner of Mario Bros. Plumbing, a family business, with his younger brother Luigi. He represents the main protagonist of the video game franchise on which the film is based, but is separate from the official depictions of the Nintendo mascot. Unlike his in-game counterpart, Mario is portrayed in the film as grumpy, rude, and practical, and is the least willing to save the Princess of the two brothers. As claimed by film director Rocky Morton (and implied in the post-credits scene), this is intentional; Morton considers this Mario the "true" portrayal of the character, and views the standard depiction of Mario as a major perversion by the Japanese people. Hoskins was once reported expressing personal distaste for his work in this role. Most of Mario's early life is unknown. It is known that, at a young age, he had to raise his younger brother (who never knew his parents). As they grew older, he trained Luigi in the family trade. One day, Mario receives a call from River Front Café, requesting their services. As they prepare to leave, the bros start to argue over their financial problems, Mario complaining about Luigi spending money on a tabloid magazine called the New York Post. Luigi replies by saying that there is an article on missing Brooklyn girls, though Mario doesn't care. They head to the restaurant, taking what Luigi called a "shortcut" through an alleyway to get there, only to see that rival business Scapelli Construction had arrived first. As they are driving back, their van breaks down. Mario tells Luigi to check their messages at a local payphone for possible jobs while he fixes the van, entering a store to get water to cool the radiator. As he is leaving, he sees Luigi hand the phone to a girl named Daisy. Mario talks to Luigi about Daisy, eventually getting him to talk to her, and watching as he offers her a ride in their van, which she agrees to. Later that night, Mario and his girlfriend, Daniella, along with Luigi and Daisy, have a double-date at an Italian restaurant. The girls begin to discuss the dig, which began when a dig team sent by Scapelli found iridium, which meant a meteorite possibly struck there at some point, and recent studies have said that this was possibly the cause of the extinction of the dinosaurs. They then begin to talk about the rock Daisy wears, as part of her necklace, and she says that this was the last thing that connected her to a childhood she never had. Luigi then tells her that he never knew his parents, as they died when he was young, and told them that Mario raised him as a parent and brother. As Daisy and Luigi look into each others eyes, Mario decides that he and Daniella will take the van home, while Luigi and Daisy can walk home. Mario and Daniella leave in the van, unaware that they are being followed by Iggy and Spike, two of Koopa's minions, thinking that Daniella was Daisy in disguise. As Mario drops her off at here apartment, he does not hear the screams of his girlfriend as she is captured. Some time after arriving at home, Luigi and Daisy arrive, getting Mario to stop the flooding at the excavation site. They end up fixing the pipelines, but are knocked out by Iggy and Spike. The Mario bros later wake up, noticing Daisy was gone. Using the pipe echos created by the screams Daisy made, they track Daisy, eventually arriving at a solid rock through which her voice is coming. Her face then comes through the rock, and Luigi tries jumping for her, but Mario held him back. Daisy then came back through, and Luigi tried to pull her through, only succeeding in taking her necklace. Luigi then decides to try and go through, successfully leaping through the solid rock, and Mario falls through. Mario and Luigi in their famous suits. The two then continue to chase after Daisy after circling a meteorite, eventually arriving in the ruined city of Dinohatten. Eventually, they spot Daisy, who is taken into a cab. Two policemen then pull the Marios away, for creating an incident, and forces them to explore. An old lady eventually confronts the brothers, asking them if they had recently arrived. During the conversation, however, the lady pulls out a taser after hearing Luigi saying they were unarmed, and attempts to mug them, but instead, she steals Daisy's necklace. Just as she snatches it, though, the brothers can only watch as Big Bertha, a large black woman, arrives, steals the necklace, shoves the old woman aside, and leaps away, using her Thwomp Stompers. The brothers are then encountered by Toad, a street musician, who begins to play an anti-Koopa song, and two police cars arrive, taking Toad and the Marios. They eventually arrive at a police station, where they are quarantined and placed in cells. While Toad is playing a song about how the Mario bros are from another dimension, Luigi asks what he meant, and Toad explained to them that the meteor striking divided their universe into two separate dimensions. The police chief then has the Marios brought out to meet their lawyer, who is really King Koopa trying to get the necklace. His attempt fails, and he orders the Mario brothers to be de-evolved. Mario and Luigi are then brought into a strange chamber, with Toad strapped into a chair. Koopa then orders the machine be activated, causing Toad to devolve into a Goomba, a loyal and stupid creature. Mario stops Luigi from attacking Koopa, and he asks what Koopa evolved from. Koopa replied by saying that his ancestor was the Tyrannosaurus. Despite threatening to devolve them if the brothers didn't tell him where the meteorite shard was, they still refused, shoving Koopa into the De-evolution machine and taking out his goons. The brothers then escape, Goombas on their tails, and hide behind a support beam. Mario then pulls Luigi away, before he can take a Bob-omb, and they head into a police garage. They attempt to steal a police car, with Luigi operating the computer as a result of video game playing, and they drive off, two other police cars pursuing them. After a short chase, they escape into a tunnel, which they are informed is incomplete, and the car powers down, as a result of leaving the city's power grid, and they fall down, through the end of the tunnel, but are saved by fungi, allowing them to leave the car unharmed. Soon after entering the desert, they become lost, and begin to argue over who is to blame. They then notice Iggy and Spike driving toward them, in a six-wheeled vehicle. The Marios then watch as the other duo drives off a cliff, and they instantly capture them, wanting information. They then tell them the purpose of Daisy's necklace, and what Koopa plans to do with it. Luigi then offers them trade: the necklace for Daisy. The minions of Koopa agree, despite not having the necklace, but, using descriptions Luigi gave them, told them Big Bertha could be found at the Boom Boom Bar. The four then find and hijack a garbage truck and use it to drive back into the city. At the bar, Mario and Luigi, who have disguised themselves in dancing clothes given to them by Iggy and Spike, find Bertha, and Mario attempts to get the necklace back by distracting her with dancing. However, just as he gains the necklace, Lena, Koopa's lover, and a Goomba squad arrive. They lose the necklace trying to escape, though Big Bertha helps them by giving them Thwomp Stompers, instructing the brothers on their use and stealing a kiss from Mario before they escape. Upon landing, Luigi once again notices the fungus is offering them a Bob-omb, though he is able to accept it this time when Mario pulls him away. As they continue running, they are corned by policemen and Goombas, but are able to escape by jumping onto a moving garbage truck on the way to Koopa's Tower. After entering the building, they notice the horrible pipeline system the tower has, and Mario instructs Luigi to shut off the heat pipes. However, just as they do this, an alarm sounds, and the bros leave the maintenance room. Just as they head for the elevator, Mario notices a pair of mechanic outfits. Putting them on, the Marios finally enter an elevator, but, as it continues upward, Goombas keep coming in, all oblivious to Mario and Luigi. Finally, Luigi gets an idea: he and Mario gently rock the Goombas, causing them to dance. With the Goombas distracted, Mario and Luigi are able to escape. The Marios eventually find Daisy in devo 4, where she introduces them to her father, who is nothing more than a mass of fungus. Mario then learns from Daisy that Daniella is being held prisoner as well, and Mario rushes off to save her. He eventually reaches the room, defeating the Goombas guarding it and saving the women inside. He then places a barricade in front of the door, preventing more Goombas from entering, and he begins to work on the ventilation shaft. As soon as he has it open, he and the girls escape by riding a mattress. As soon as he gets down, Koopa is distracted long enough for Daisy and Luigi, who have been captured by Goombas, to rejoin Mario. Koopa then approaches them with a flamethrower, declaring that he had won, but announcements from his communicator distract him. This gives Luigi enough time to grab a Banzai Bill, which he gives to Mario. He then fires it using a Thwomp Stomper, where it flies toward Koopa and knocks him onto a vat in the streets. Mario follows him down to fight, one of his hits knocking the meteorite shard, which was on Daisy's necklace, to the ground. As Lena runs off to place the shard, which she caught, in the meteorite, Daisy and Luigi go to stop her as Mario fights Koopa. As their fight on the catwalk continues, Mario pulls the Bob-omb out of his toolbag. He winds it and sends it toward Koopa, thought it falls through a crack in the ground. As the fight continues, the dimensions begin to merge as Koopa tries to hit Mario with his fire gun, until it breaks. A Goomba then hands him a De-evolution gun, but Mario dodges the blast as he fires the gun, instead hitting Scapelli nearby, who turns into an ape. Koopa then fires at Mario again, though he uses a mushroom to block the blast. The fungus then grows in size, eventually deflecting the blast, causing Koopa to fall over. The dimensions then become two again. Luigi eventually rejoins Mario, handing him one of two de-evolution guns he gained from Toad. The Mario bros then begin to devolve him. The Bob-omb then finally reappears below Koopa, having finished its long trek and it explodes, knocking Koopa into the vat below. Silence then fills the city until President Koopa emerges from the vat, now in the form of a Tyrannosaurus. The brothers then blast him again and again until Koopa finally devolves into primordial ooze. The citizens of Dinohatten then cheer at the fact that their evil leader has been defeated. Over the course of the next three weeks, Daniella moves in with the bros, and is now making dinner. As they go to eat, Daisy bursts through the door, wearing military clothes and holding a flamethrower, and asks for the brother's help. They then put their tool belts on, ready to go. 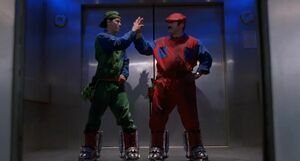 Mario and Luigi standing in an elevator. Mario trying to get Daisy's necklace back from Big Bertha. Mario and Luigi in a room with fungus. Mario and Luigi celebrating Koopa's defeat. This page was last edited on April 4, 2019, at 22:07.